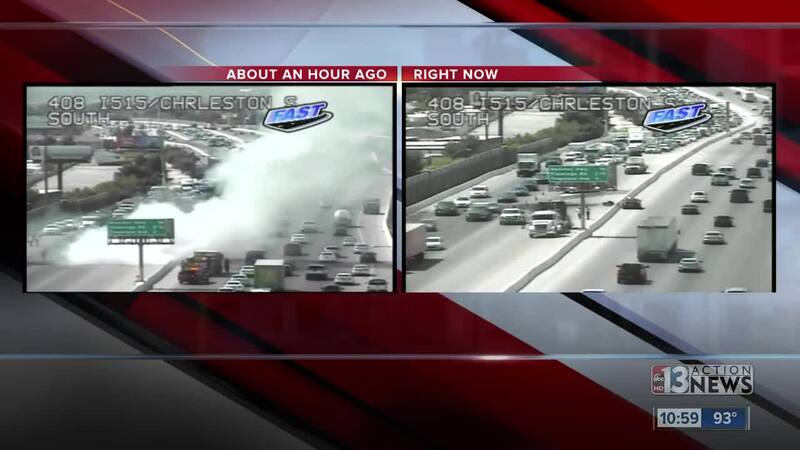 A vehicle caught fire on northbound U.S. 95, near Charleston. It has forced a complete closure of northbound traffic and major traffic delays. This is a roundup of all the breaking news from around the Las Vegas valley for June 25, 2018. Detectives from the Missing Person Unit are asking for assistance in locating 72-year-old Marilyn Teague. She was last seen yesterday at 2:00 p.m. when she got on bus. Marilyn took the CAT bus to a movie theater and did not return home. Marilyn was last seen in the area of Flamingo and Spencer wearing a blue shirt, blue jeans, black shoes and carrying a large pink purse. Anyone with information regarding Marilyn Teague’s whereabouts is strongly encouraged to contact the Las Vegas Metropolitan Police Department at (702) 828-3111 or the Missing Persons Detail during business hours at (702) 828-2907. UPDATE: All lanes are now open on northbound U.S. 95 and the vehicle has been cleared. A crash is blocking two lanes of traffic on southbound U.S. 95 at Rancho Drive. Two vehicles were involved in the collision, and a backup is developing. The Las Vegas Fire Department believes squatters are behind the fire that began at a vacant home at 1933 Sweeney Ave., near Eastern Avenue and Charleston Boulevard. The fire had been reported as knocked down as of 4:45 a.m.